Maxshop is a new responsive OpenCart theme with clean, simple interface and lots of powerful features. It is ideal for any heavy online stores. Let’s explore this eye-catching template and get the real experience now! 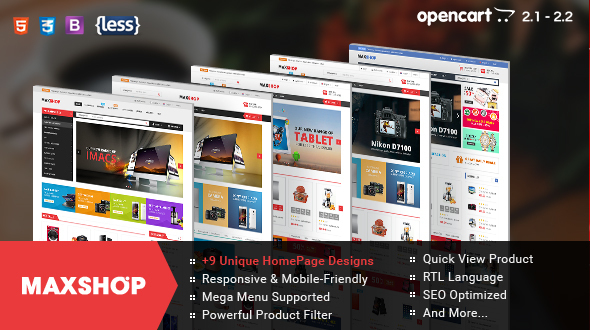 The OpenCart store theme is built with new web technology: Bootstrap 3, Font Awesome 4, LESS, CSS3, HTML5 that makes the theme more powerful and flexible. Maxshop comes with 5 Preset Color Styles: Red (default), Blue, Green, Cyan and Orange. You can also totally change your color by using c-Panel. This eCommerce Opecart theme is fully and looks delightful across different devices and screen layouts as well. It enables to show sales and promotions, upcoming events as well as for other different purposes. Your customer can easily find product according to the category, child category or find what they are looking for by entering the product name, description, price, sku. The OpenCart theme supports to work well with any language installed on your website, it enables you to translate your website to any language. Maxshop also supports right-to-left language (Arabic, Hebrew etc. ).